Coyotes are nothing if not adaptable, and they’ve made themselves at home all across the United States. Only weighing in between 20 to 45 pounds, coyotes aren’t as big as their wolf cousins. Despite their small size, they can make a lot of noise. 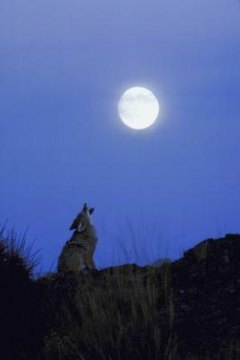 Just a few coyotes can fill the night with their distinctive, high-pitched song. Despite the cacophony a few coyotes can make when they start howling, coyotes actually live in small family groups. Typically, there are two parents and their cubs that haven’t ventured out on their own yet. A pack of coyotes usually includes four to six members. They breed in the spring, and in the summer you may hear the coyotes begin to howl as the pups start to practice their signature sound. A common reason coyotes start howling is to find one another. They may spread out to hunt individually, then howl to locate one another and bring the family back together. Their howl can be heard over long distances, and when the pack starts to howl to one another, they can all find each other at the end of a hunt. Coyote packs claim a territory, but they often aren’t the only pack in the area. Coyotes will howl to make neighboring packs aware of their presence. By letting each other know where they are, it’s less likely for a coyote to stray into unwelcome territory. Due to their unique call, even a small pack can sound like a substantial threat to curious coyotes in other territories. Trying to count the number of coyotes by listening to their howls is next to impossible without training. A coyote's small stature means larger predators pose a threat, especially to small puppies. If a threat comes near a coyote’s den, the parents will howl to distract the unwelcome visitor. To protect the pups, coyotes will scatter away from the den and howl, trying to lead the predator away from the vulnerable youngsters. The intruder will likely head toward the howls instead of the helpless pups back at home. Penn State: Why Do Coyotes Howl?